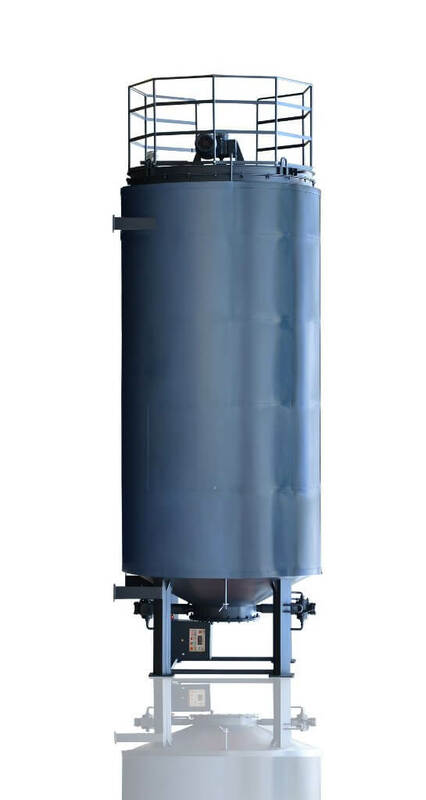 SBM-15 Modified bitumen collection tank (UVB-2) - GlobeCore. Oil Purification Systems. The SBM modified bitumen collection tank is designed for storage of modified bitumen produced with the UVB-2 unit. It can be supplied as a stand-alone product and be retrofitted into existing modified bitumen production equipment. The product is equipped with automatic agitator and heating circuit. The system is equipped with Dinel and Wika temperature and level sensors as well as overflow sensors. The main component of water-bitumen emulsion is obviously bitumen. Consistent production of emulsion is only possible with constant availability of the material. Therefore, companies which use bitumen in their production process on a daily basis, should ensure correct storage conditions. Many companies prefer to maintain own bitumen storage facilities, allowing regular construction and repair works without the need to stop for bitumen supply and market price variations. Storage of bitumen and bitumen emulsions is a complex process. The most important part is heating of the material in specially equipped tanks. Bitumen should not settle or break down into water and binding, which may occur in bitumen emulsion storage. Heaters are most often integrated into the walls of the storage tank and allow the material to stay at the required temperature. Heating may be performed by steam, oil or by low temperature electric heaters. Bitumen storage facility can be of two types: vertical and horizontal. However, vertical storage tanks are more popular today. They are economical and easy to operate and maintain.